This may not be strictly true, but it seems to me that the Guy’s at Spring are always banging on about AspectJ and Aspect Oriented Programming (AOP), to the point where I suspect that it’s used widely under the hood and is an integral part of Spring and I say “widely used under the hood”, because I haven’t come across too many projects that do use AspectJ or AOP in general. I suspect that part of the reason for this is possibly down to the fact that AOP different is a concept to Object Oriented Programming (OOP). AOP, they say, is all to do with an application’s cross-cutting concerns, which translates to mean stuff that’s common to all classes within your application. The usual example given here is logging and example code usually demonstrates logging all method entry and exit details, which is something that I’ve never found that useful. 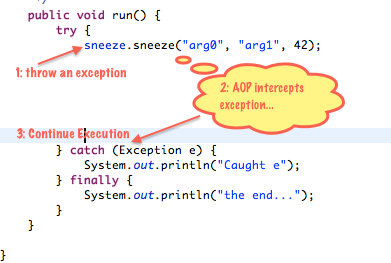 The other reason that I’ve not seen it used is that the AspectJ documentation is a bit ropey. // Obtain a suitable logger. logger.info("Write something in the log... We have caught exception in method: "
+ methodName + " with arguments "
+ arguments + "\nand the full toString: " + stuff + "\nthe exception is: "
whereas public on its own throws a BeanCreationException exception when loading the Spring config. Finally, in covering the after throwing advice, this blog only really touches on AspectJ and there are other useful AspectJ advice annotations that I will probably be covering in the near future.